I have been Painting for over 12 years! These saying are original. I come up with them. I write my own sayings. After I think a quote up I hand paint it on to a stretched canvas. Each piece is one of a kind. If you see one of my quotes you like Please ask me to paint a custom version for you in your favorite colors. 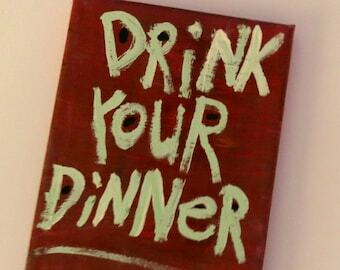 I create each saying and hand paint on canvas or wood blocks. I love color and texture and try to incorporate both into most of my art. I love to be commissioned to do custom work using my words or yours. If you see one of my quotes you like I would love to paint it in your favorite color. Offer free delivery on custom pieces to Las Vegas residents. All of my WORD ART PAINTINGS are original sayings, phrases, or ideas that I write and paint by hand on my own original abstract backgrounds. You can collect and display in your home. As a child my handwriting was a disability and now it is quite the blessing. It is one of the things that stands out and makes me uniquely me. Nobody writes or thinks or paints just like me. This is just perfect--I work in violence prevention ed, and this piece just spoke to me. Thank you so much for your work, and sending it so carefully! 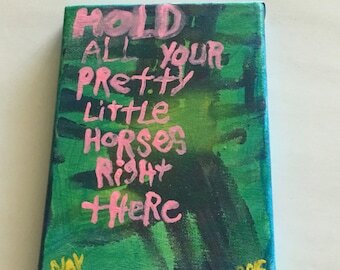 I bought one of Nay’s pieces of art for my sister who sent me the link as a hint of what she’d like for the holidays. Needless to say, the piece was gorgeous, the presentation was on point, and my sister was thrilled! Nay has been so great and I look forward to buying more from him in the future! Thank you Nay! Nay in his Art Studio. Original. I came up with it. I write my own sayings. After I think a quote up I hand paint it on to a stretched canvas. Each piece is one of a kind. If you see one of my quotes you like Please ask me to paint a custom version for you in your favorite colors. I have always kept a journal on hand to write down all my sweaty thoughts. In 2006 that notebook exploded into an art studio and my words went from the note book to the canvas. A passion was ignited and I have not stopped painting. A few years later after selling thousands of paintings online and in person at street fairs and small galleries, I discovered Etsy and have enjoyed selling here and even doing a few custom pieces along the way including one to a very fashionable celebrity . It is super fun to see the response folks have to my thoughts as well as my painting style and handwriting. I was once told to be ashamed of my handwriting. I decided instead to embrace it as an unique talent. lol! I enjoy people viewing my art even if you just window shop. Hi My Name is NAY - please enjoy all of my artistic creations for sale here on etsy! As of now I have no policy. Happy to accept all credit cards as well as PayPal. I adore custom work. I would be happy to paint my words or yours in your choice of colors. I will do any size you would like Just let me know the size and I will Quote a price. For customs I require 50% up front for supplies. Or I can make a custom listing and you can prepay the whole thing. I give my self 2 weeks for painting, then I email a photo for approval before carefully packing and shipping. Thank you for your interest. Please have a great day.